I started with the Hub and 2 bookend speakers. After listening to the audio it became clear the speakers were being overwhelmed by the bass. Now like many of your the first thing you are told is "did you make the proper adjustments"? I stated if the tech could send me the baseline settings I would start there. He gave one setting and it was nothing different from what I had already tried. Contacted Klipsch and the tech told me the reason for this was I needed a bass unit to remedy this situation. Ordered installed the bass unit and was immediately feeling I was sold a watch from the inside flap of someones overcoat. If I adjusted the bass to where you could hear it well let's just say it was overwhelming my wife stated all you could hear was base and we agreed. The end results you either hear the bass or you don't. This was after the firmware update that specifically stated it would address this bass issue. Hell, my dog lays right next to the bass unit and sleeps; telling me if my dog can't hear and I can't hear it is not working properly. Other issues include the speaker leds come on during the night all on their own no sound just the leds. I am really worried I spent my hard earned money on such an ill-engineered product my feelings are like many, no updates and no news on the WISA speaker system. They have abandoned us. 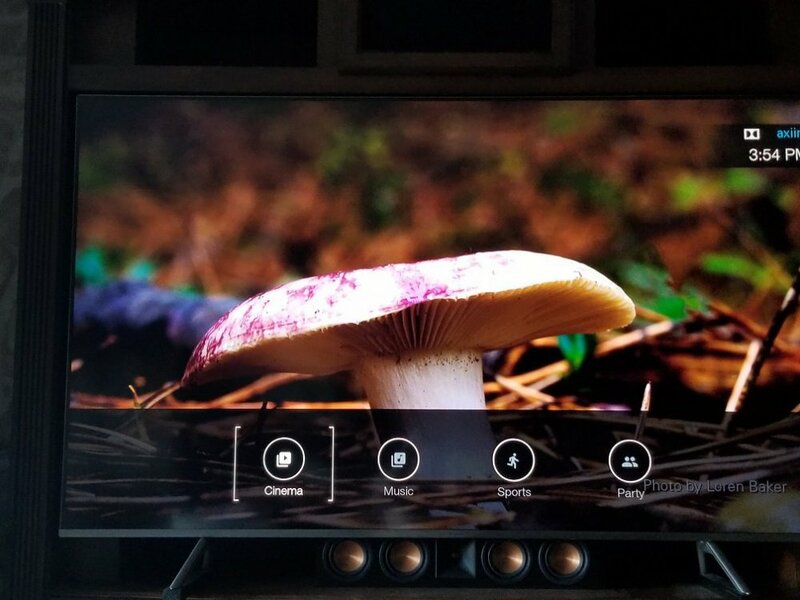 What if the flimsy remote control or the controller stops working I am left with speakers that won't work unless I put out $1k for something like the Axiim Q UHD? I owned the Klipsch Heresy speakers back in the day and was sure WISA setup would be a great product to invest in guess I was wrong. One other question: If you setup your flatscreen TV with an OTA antenna and no other input how do you get the audio to the HUB? Check the review above of an alternative hub that works with your speakers. It also has bass control for each individual speaker. For your question about OTA sound, you should be able to use the ARC via hdmi to your receiver. I'm not 100% positive that the tv will encode the antenna input for ARC though. - It works with the Klipsch speakers. 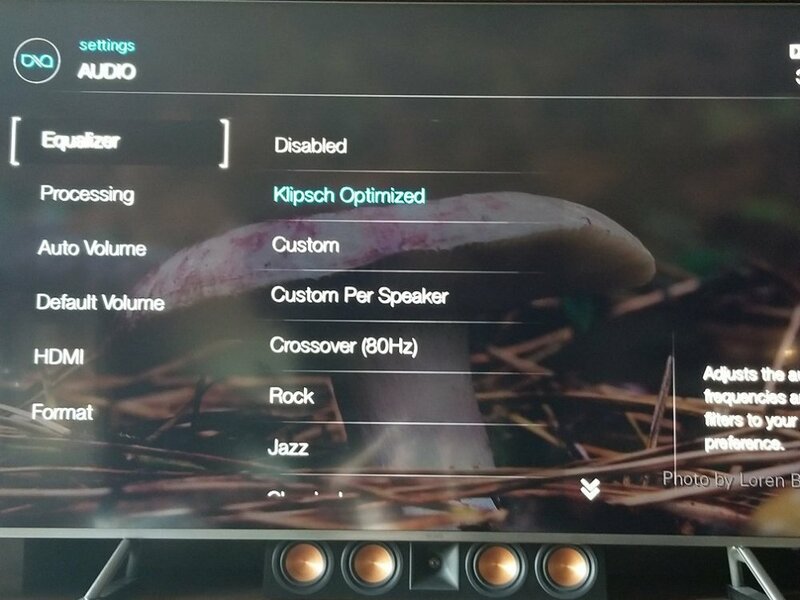 In fact, it updated the firmware of the speakers once they were connected and the audio profile chosen for me was "Klipsch Optimized". Clearly they made a huge effort to make the receiver compatible with the Klipsch WISA speakers. - The speakers sound perfect. I played music, movies, and video games. I tried AC3, EAC3, Dolby True HD, and DTS. Each worked perfectly. It's been about 3 hours and I haven't had a single blip from any of the speakers. Normally by this time, one would have dropped out for a few seconds. Still remains to be seen if the speakers drop and/or disconnect. I'll update again in a few days. - It has 6 HDMI inputs that ALL support UHD and HDR. - ARC worked perfectly the first time I tried it. No wonky setup, etc. It Just Works. - It has a setting for Default Volume When Powered On. My Klipsch hub would randomly power on at 100% volume, so this setting is appreciated. - The menu system is really good. It's graphical, customizable, easy to navigate, and relatively pretty. It's MILES beyond the Klipsch hub menu. - It has an eSata connection if you want to plug in a hard drive for music. I won't use that, but crazy that they include it. - The attention to detail is awesome. You can choose your menu accent color in the settings. When you do, the matching Android App also changes it's accent color. - Everything is super responsive. No lag anywhere. Klipsch makes amazing speakers, but they should seriously scrap their plans to build a hub v2 and just license this thing. It's SO good. If you guys have any questions, let me know! Thank you for this extensive post. How are you experiences now? Still happy? 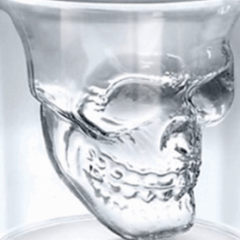 Despite the steep price tag I am seriously considering this. I am looking into connecting my Xbox One X for 4K movie playback into this as well. I've been having a spate of disconnects from the speakers averaging one disconnect after every other viewing lately. Last night two went out at the same time during a program. That was it, I ordered the Axiim. I just reread that review and just saw that it has an app too. Awesome, I downloaded it already. I can't wait! I’ve been contemplating getting the Axiim Q UHD myself. Every couple weeks I have an issue with a speaker dropping from the RP-Hub1. Sometimes it’s easy to add it back, other times I have to reset the whole system. This has been going on nearly two years now. I gave up on the idea of support after they said I needed to ship the system back to them for testing. 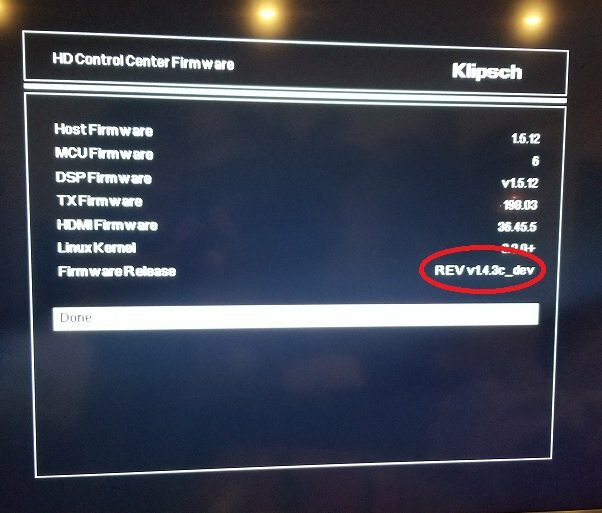 I find it hard to believe Klipsch isn’t going to at least release an updated version of the RP-Hub1 with HDMI 2.0b compliant ports that would allow HDR/DV pass-through. I’m having to daisy chain my PS4 Pro through the input on my Oppo UDP-203, then split the video to the TV and the LPCM audio to the RP-Hub1. I’m thankful that the Oppo allows me that solution to get both optimal UHD video and uncompressed surround sound. But the fact that Klipsch advertised the HD Wireless system as a “future-proof” solution borders on fraud at this point. I'm still incredibly happy. I've had literally zero drops since I've had it. I was getting multiple per day before. The HDR 4k passthrough works perfectly. Sound is great. It's basically flawless. The one minor complaint I have is that it runs hot, even when it's in standby mode. I have it in a closed cabinet and it generates more heat than I'd like. That hasn't impacted performance in any way but makes me wonder about longevity. This is a no regrets buy and completely transformed my experience. Great to hear - thank you so much. I actually too have a closed cabinet with glass doors. At first I thought the drops were because of the cabinet, but that doesn't seem to be the case. For me the challenge will be connecting my Yamaha CD NT670 which is a network player that doesn't have HDMI out. It doesn't produce any video signals since it's a music device. I found a converter for RCA --> HDMI which I'm going to test with the Klipsch first. I installed the Axiim last night and after a few hiccups with speaker searching everything is up and running good so far. I made the mistake of thinking that hitting the reset button on the back of the speakers would be enough to prepare them to be searched, but some of them had to be unplugged for 20 seconds then reset, or plugged in while holding reset. And in case of the subwoofers I had to plug the Klipsch receiver back in and remove them from the menu. Setting it back factory defaults will "release" them as well and is recommended to anyone else doing this. Upon discovery, the speakers immediately downloaded updated firmware. In a couple of cases some speakers downloaded firmware in increments or layers and took longer than the others. I used this opportunity to update the 5.1 speakers in my office as well, taking them downstairs one by one as I already had the sub downstairs for troubleshooting and didn't want to interrupt the Axiim. It was kind of satisfying as they all seemed thirsty for WISA updates. The speaker firmware downloaded by the Axiim works with and was discovered by the Klipsch receiver in my office without issue. 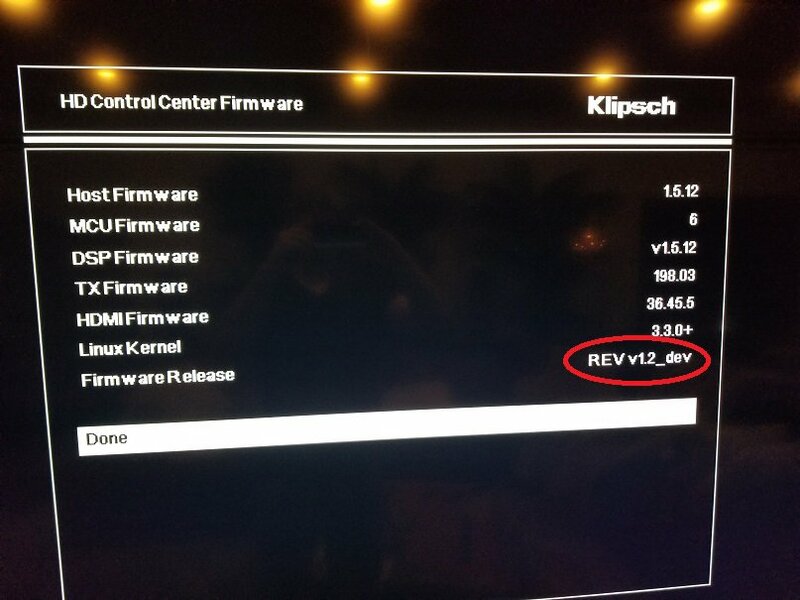 This is where I discovered the Klipsch receivers have different firmware revisions (hardware?) despite both being updated to the May 2016 firmware. The menu system for the Axiim is all very fluid and professional looking and feeling with very little to configure as out of the box it seems to have favorable defaults like CEC enabled and a much more sensitive default volume gain over the Klipsch. The only bug I've found so far is the inability to switch the preset out of "Music". I'm sure defaulting it will return a choice but hopefully this will be resolved in a future firmware update. Anyway, I'm still tinkering with it, just giving an early first impression. Thank you very much for sharing. Mine has actually been delivered today - I am going to setup everything tonight! Updated the firmware for the HD Wireless system, mine is a 5.2 setup, the update went smoothly. No changes to any menu items, and the system still sounds great. Tried plugging my PS4 Pro into HDMI 1, it still doesn’t support full bandwidth UHD functionality. I guess time will tell if it’s more stable with regard to speakers dropping. So I've been trying to get this update to take for well over a hour. The hub updated without too much trouble (had to try it twice before it took). Now I've been trying to get the speakers' firmware updated. This has taken countless attempts. With almost each try presenting a different behavior. I finally got 5 of them done. The side right wouldn't take at all for whatever reason. I have been going on to the speaker settings and selecting Update Firmware over and over. Just now (probably my 15th try) is it doing something new. I'm stuck on Updating speakers step 1 of 2.... - it sits there for a few minutes. Then it flashes through the 6 speakers in order saying it is updating each in step 2 of 2 and then nothing. The side right speaker will not update. I'm going up for now. I will do battle again tomorrow. I’ll have to check the speaker update myself, I just assumed that whole system updated correctly. It did cycle through the speaker update pretty quickly. Question on setting up the speaker initial sound levels on HD1. Has anyone been able to achieve the standard 75dbl sound level across all 7.2 speakers? The highest I can get on my sound meter is 71dbls. Basically one of my rear speakers is maxed at +10 at 71dbls and set my other speakers to this level. At 0 +/- I barely get 62dbls. It’s like the default sound level is way under standard. Bass has no low volume punch and needs a kick. 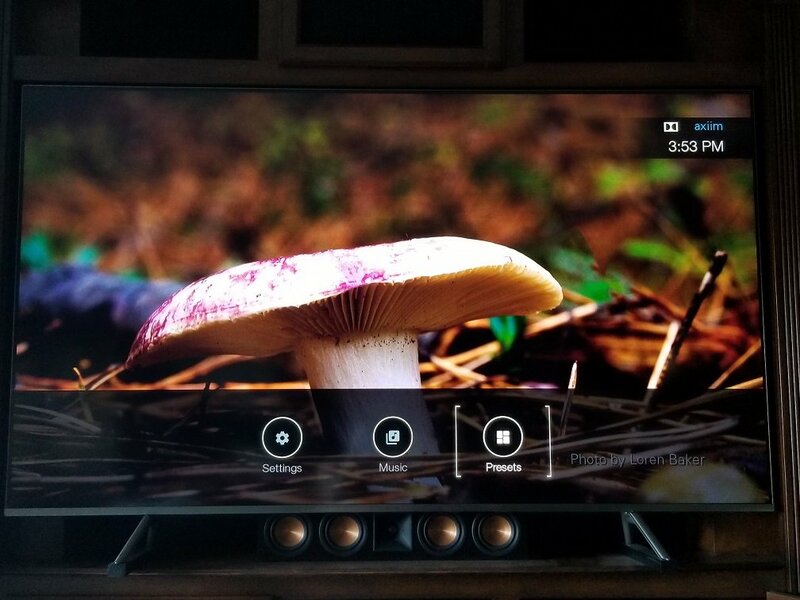 Can not remember the last time I posted seems like years and yet the hub is still not performing to expectations; shutting down, not responding to buttons on the top side of the unit, failing to provide audio even though the hub is turned on, so many issues. Many having to buy another company's HUB this is really the ultimate in failure when it comes to the WISA rush to market products by Klipsch. Looks like I will be out of pocket of 1000.00 dollars to complete my system. Great news on the Atmos, but you know it's gonna be poor/lazy man's Atmos with integrated speakers angled on top of the front speakers instead of ceiling mount. Update to the Axiim receiver: Have not had one problem losing speakers since I installed it. Sorry for the delay. There is no other way to reduce the bass other then turning down the sub volume or putting it in "Night Mode" which reduce the bass to almost off. One trick some customers have done is turn the speaker volume up on all the other speakers and have the Sub volume down. That trick also works for the customer that want more bass. That just do that trick in reverse. Buy having sub volume up and the rest of the system down. Other then that, there is not an option at this time for any other controls for the bass. I have how ever passed this along to the development team to see if it is possible to add this to the next hub update. So they are aware of this problem. The fix they are proposing is at best an emergency solution, not working well. I really hope they take it serious enough to actually implement an option for bass adjustment in the next hub-update so that I am able to play Spotify again. I just can't play any songs anymore because I have two options: 1. play with low sound and high bass, 2.play with high sound and high bass (and broken window glasses and neighboor complaints). This update need to be priotitized before everyone on this forum goes to Axiim instead. Can't really blame any for doing so.